If you’re thinking about buying a boat, you’re thinking the right way! Owning a boat for the first time is thrilling and opens your life up to a world of adventures on the water. There’s a reason over 250,000 boats are sold in the U.S. every year, and the number of boat enthusiasts is only growing. There’s no substitute for having your own boat — when the weather turns nice, and you load up the whole gang for a day a fun, you’ll see that there’s nothing better. To maximize the fun from your new boat, you’ll first need to know how to pick the right one. As a first-time boat owner, there’s a lot to remember when choosing which one is best for you and your family or friends. That’s why we made this guide to help you through the process of first-time boat buying. This is the fun part! No matter what it is you like to do on the water, there’s a perfect boat for you. We’ll give you the rundown on the types of boats that might work best for you and your family. So what’s a good first boat to buy? It all depends on you. Before you can decide which boat is right for you, you must first determine how you’ll be using it. Boating is all about fun, so pick one that’s best suited for what you like to do. Do you like zooming through the open ocean, or do you prefer the tranquility of lakes and harbors? Are you all about wakeboarding and towing inflatables? Finding secluded reefs and snorkeling? Or maybe you’re just looking for a smooth and comfortable ride. Decide where and how you’ll want to have your boating fun, then go from there. 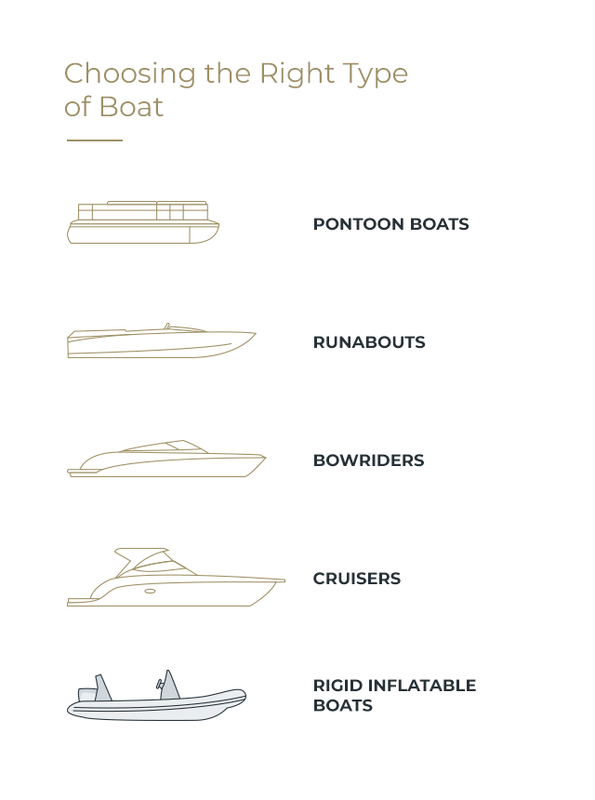 Here are some of the boat styles that you may want to consider. Pontoon boats get their name from the aluminum “logs” that they rest upon, which give them their signature look. They’re mainly used for freshwater and harbors because the pontoons provide excellent stability and don’t handle well in rough waters. If you value stability and wide-open deck space, then a pontoon boat may be for you. Newer models have an improved design compared to some of the older and less attractive versions. These boats are very popular in the freshwater boating community for multi-purpose recreational use and because they tend to be a cheaper option. Runabout boats are perfect for those who like to show up in style. While they’re not as functional as some of the other types of vessels, these boats are great for people who mainly want a comfortable way to get from one spot to another. Runabouts are popular in freshwater communities and relatively limited in their functions. They’re not the best for watersports, but if you’re looking for a beautiful boat to cruise around the lake, sip drinks and soak up some sun on, they may be the best bet for you. The name “bowrider” gives it away. These boats are designed with a comfortable seating area in the forward cockpit. More seaworthy than pontoon boats, these boats are also multi-purpose. They’re best for day trips, as most don’t have an overnight cabin. The main appeal to bowriders is their comfortable seating for guests up in the bow. It’s lots of fun to sit up there when you’re going fast — it feels like you’re flying over the water! These boats can also be used for watersports. Cruisers are the next step up in seaworthiness from a bowrider. These boats don’t have the open bow style of a bowrider, but instead have an enclosed cabin, which makes them more suitable for overnight trips. This design also makes cruisers more seaworthy — if you take a wave over the bow of your boat, it’ll just wash off instead of swamping your boat and everyone aboard. Cruisers can be used for watersports but are a popular choice for people who mostly like to — you guessed it — cruise! Think dinner and music with friends and diving off the back once you’re at your favorite getaway spot. Rigid inflatable boats are quickly becoming the go-to choice for families looking to maximize their boating options. Commonly referred to as a “RIB,” they have inflatable siding and a hard v-hull. The unique thing about rigid inflatable boats is that they combine the seaworthiness of larger vessels with the functionality and open-deck plan of typically less seaworthy vessels — this combination is owed to the inflatable part of the boat. It not only provides extra stability and makes the boats virtually unsinkable but also allows them to handle well in rough conditions. Here at BRIG USA, rigid inflatable boats are our thing. We chose to focus on RIBs because we wanted to make the ultimate product for our customers, and the versatility and functionality of the RIB design made them the obvious choice. The priority in any boating excursion is safety for you and your passengers. Especially in an ocean environment, conditions are always changing, and you want a boat that’s equipped to handle any situation. The United States Coast Guard and Navy Seals use rigid inflatable boats because they’re extremely tough and seaworthy. Not only that, but their lightweight design also makes them extremely fast and buoyant. The inflatable sides of RIBs are also much more kid-friendly than their hard-sided counterparts. When the inevitable little missteps happen, it’s nice to have a soft landing. The combination of inflatable siding and a hard hull gives rigid inflatable boats the best of both worlds. They have the easy tracking of a hard v-hull with the significantly increased stability of an inflatable. This design also makes RIBs virtually impossible to flip or sink. In a rigid inflatable tender, there’s little risk of tipping over because the inflatable tube and hard hull combination provide the ultimate stability. The high stability makes loading and unloading passengers and cargo much safer. It also dramatically increases the amount of weight the boat can carry. Called the “Safe Working Load,” it’s the Coast Guard’s guideline for how much weight a vessel can hold and still operate safely. Since rigid inflatable boats are much lighter than their fiberglass counterparts, it means they’re also much more fuel efficient. You’ll be able to pack in more fun and spend less time waiting for a spot at the fuel dock. Rigid inflatables are forgiving. Wouldn’t it make parking less stressful if you had a protective cushion around your sportscar? Not to say that you want to run into everything, but having inflatable siding is a great stress-reliever — especially if you’re a new boat owner. Inflatable siding helps you avoid damaging other boats, the dock and your vessel. The open floor plan and inflatable siding of RIBs make them the perfect family boat. The sides make for a great diving platform, and the open deck space gives you and the kids room to play. Also, it’s nice to have the safety of inflatable sides if you’re teaching the little ones how to dock a boat. Now that you know why we think RIBs are the best, let’s get back to the basics of buying a boat. Figuring out the right size for your first boat is an important step. The larger the vessel, the more features it’ll have — water and plumbing systems, kitchen areas, cabins, toilets and navigational equipment included. However, bigger isn’t always better — especially if this is your first boat. Sometimes, people buy a boat that’s too big, and then they’re reluctant to use it because it’s more complicated to operate than a little one. We recommend not going too large for your first — start with something easy, and you can always upgrade later. It may take some time for you to figure out what features are important and not so important as you use your first watercraft. Choosing the right engine for your boat and your recreational purposes is a crucial step. Again, it depends on what you like to do — if you mainly enjoy cruising around, then something small and fuel efficient will work well, but if you want to go fast or tow people for watersports, you’ll want something with more power. Consult your dealer for more information about which option is best for you. Many people end up wanting a different engine later because they didn’t choose one with enough horsepower. You can’t base your decision solely on the top speed of a motor. If you think you’ll want to tow people for watersports, you’ll want a motor that doesn’t have to run at its limit to get the speed you want. Having a larger engine isn’t just about top speed — you should be able to do most of your activities at an efficient level of RPMs. Also, consider how many people and how much cargo you’ll want to carry. Even if a boat runs well with you and the dealer aboard, you’ll want to keep in mind how it will be with another hundred or thousand extra pounds. An excellent way to ensure that you get a large enough engine is to get one rated at the top end of your boat’s engine capacity. While it may be counterintuitive, a smaller engine doesn’t always mean it’s more efficient — if you’re pushing the smaller engine to its limit, it’ll likely burn more than a larger engine running at a lower rpm. Boat shows account for almost 50 percent of annual boat sales for some dealers and are a great place to check out models that you’re interested in buying. Seeing pictures and reading specs online is okay at first, but before you can know if a boat is really for you, you’ll want to see it in person. The best part about boat shows is that they’re hands-on. You can climb aboard, test the physical components and feel out the layout of the boat. See how it feels to sit at the helm. Do you feel cramped? Do you have enough visibility? Ask a dealer about access to the engine room and how to perform routine maintenance checks. Look for storage compartments, and try to imagine how much room you’ll have — not only with your passengers but also with all of your gear and their gear too. Find out if there are any unique features you can test. Pop-up beds or sun shades? If you’re interested, figure out what the tow-point is like for watersports. If you try all of these things and the boat feels right to you, the next step is to set up an on-the-water test drive — this step is a crucial one that you shouldn’t skip, even if the boat seems to be perfect. Does the boat track well and stay true to a course without constant correction? Is the throttle and shifting smooth and easy? How does the boat handle at low speed? How quickly does the boat get up on plane? Does the boat handle chop well without slamming or pounding? How is the engine sound? Is it quiet enough that you can talk over it? If everything seems to perform well, there’s one more important thing to check before you move on to buying your boat — quality. It’s sometimes easy to overlook the lower quality of some vessels when you’re buying them new or slightly used — this oversight is usually because everything still looks perfect. But using a boat will make the elements that aren’t as well-engineered soon apparent after purchase. This issue is why it’s so important to carefully examine the quality of craftsmanship on your boat. Do an overall quality check where you test the sturdiness of features and handles. Give them a firm shake, and imagine what it would be like if you were holding onto them while the boat was bouncing up and down. When you buy a cheaper boat, you’ll end up doing more replacing and repairing, which costs you money that you were trying to save in the first place. Skip the headache by buying quality from the start. Check out the BRIG USA boat show schedule to see some of our industry-leading designs! The next decision to make is whether to buy a new or used boat. There are pros and cons of each, and it ultimately depends on your personality. Plenty of good used options are out there, but if you like to buy things fresh off the line, you’ll have an aesthetically perfect boat. If you do decide to buy a new boat, you can often get a commitment from the dealer for warranty coverage throughout the first year or two. But before purchasing, contact the dealer and ask around first — make sure their commitment to customer service is top-notch. Used boats are often not covered by a manufacturer’s warranty, which means they’re a little riskier to buy than a new model because you don’t know their history. However, there are measures you can take to determine the state of a used boat. Marine surveyors are expert boat inspectors and experienced in determining the condition of used boats. Find a reputable surveyor near you through the Society of Accredited Marine Surveyors or the National Association of Marine Surveyors. If you hire a professional, you can rest easy knowing that you’re buying a boat without any hidden problems. Buying a used boat has more advantages than just the reduced cost. It’s much more typical with larger vessels with more complicated systems — but any mechanical issues with a new boat often arise within the first year. So when you buy a used boat, any kinks that were there from the beginning have been worked out by the time you get your boat. Ultimately, buying new or used comes down to your preferences. Do you like the idea of buying everything new and perfect, or do you not mind if there’s a little use for a reduced price tag? If you enjoy working with your hands and taking on mechanical projects, then buying a used boat could be a fun project that will save you money and give you something to work on! What Are the Ongoing Costs of Owning a Boat? The ongoing costs of owning a boat are something to factor into your purchase. Think about where you’ll store the boat. Are you going to need to rent a slip to keep it in the water, or are you okay with keeping it on a trailer? You’ll often have the option of buying the boat outright or choosing a financing plan to pay for it over an extended period. It’s best to finance through a reputable marine lender because they have experience with boat loans. Check with a tax expert to determine any advantages your boat may give you too — people are sometimes able to claim these vessels as a second home or business expense. You’ll also need to register your boat within your state and get the proper insurance. Depending on the size of the vessel, there may be different requirements, so check with your dealer to determine what you’ll need before making your purchase. Another ongoing cost that you shouldn’t overlook is maintenance. All boats need it — it’s not a matter of if, it’s a matter of when. To keep your boat in top shape and functioning correctly, you’ll need to perform occasional maintenance. Research your boat’s model before purchase to identify common maintenance issues and what they might cost. It’s also wise to ask your dealer for the same information before buying. Based on their answers, you’ll get a good idea of how honest and helpful they are. One of the advantages of rigid inflatable boats is that they require less maintenance than other models and types. Part of the reason for this difference is that they’re less likely to get damaged in the first place because of their inflatable siding. Their components are easily replaceable, and BRIG USA offers free owners manuals and replacement parts for all of our models. Get Out There on the Water! No matter what type you choose, having your own boat leads to unforgettable memories and adventures on the water. Here at BRIG USA, we make only the best products for our customers. We don’t cut corners, and we specialize in creating top-of-the-line rigid inflatable boats. We build all of our designs with fine European craftsmanship and meticulous attention to detail. We manufacture all of our boats at our 100,000-square-foot headquarters in Europe, where our ex-military and aeronautical engineers continually create industry-leading designs. With the largest inventory of premium RIBs in the United States and competitive pricing, we’ll help you find the perfect boat for you and your family. To learn more about BRIG USA’s boats or get answers to any questions, drop us a line — we’re more than happy to help!